The internet is the greatest disruptive innovation to education that we’ve seen so far, well beyond Gutenberg’s printing press which was born in the 15th century. Its effect is so great that we have absolutely no idea what the education industry will look like in 10, 20, or 50 years. 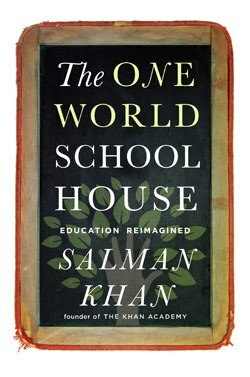 This book, The One World Schoolhouse, is Salman Khan’s vision for what the future of education looks like — one where anyone around the world can receive a free, world-class education. Salman Khan is the founder of the Khan Academy, a non-profit educational website that has delivered thousands of lectures to 250 million students around the world and received funding from Google and the Bill and Melinda Gates Foundation. In the age of our parents, or our parents parents, you graduated college, got a job, and stayed there for 40 years before retiring. Those days are over. In our era, the onus of acquiring skills and gaining experience is on each of us for our entire adult lives. The tests that matter aren’t administered by a central authority, they’re the challenges that we face in our everyday lives. Our outdated education system, which is a carryover from the 18th century Prussian model, is designed to produce obedient factory workers. But what it’s producing these days is debt-laden adults ill-prepared for the real world. The One World Schoolhouse imagines a future where a high quality education is available to everyone around the world, for free. If you’ve ever used Youtube to teach yourself something, you probably have at least a very basic idea of how this system of information dissemination works. You start with the best teachers in the world but instead of having them lecture a few hundred students in person, they address an audience of millions by recording lectures and putting them online. Couple that with interactive course material that’s suited for exactly your skill level, and you have a very scalable system. The way that Salman Khan fell into online education is itself a great story. While Salman was managing millions as an MIT-graduate hedge fund manager, his younger cousin Nadia was failing 6th grade math. Due to the “tracking” system of her school which threatened to place her in a remedial math class, she had little chance of being on the advanced math track which taught students algebra in the 8th grade. And if Nadia didn’t take algebra in 8th grade, then she couldn’t take calculus in 12th grade, and so on. Salman committed to tutoring her over the internet since they lived thousands of miles apart, and his personalized online video classes via Skype made all the difference. One day he decided to record his lessons, in math subjects ranging from simple arithmetic to calculus, and put them on Youtube. Before long, millions were watching, and the Khan Academy was born. Today, The Khan Academy has hundreds millions of students around the world learning for free, and Nadia is studying medicine at Sarah Lawrence College. The body of knowledge that can only be gained in a formal setting is getting smaller and smaller every year as the internet becomes further engrained in the way that we learn. I think everyone, of all ages, all industries, and all countries, has something to learn by considering what the future of education looks like. I really enjoyed this book and I highly recommend it. As of publication of this review, it’s also a fantastic bargain on Kindle at just $2.99.